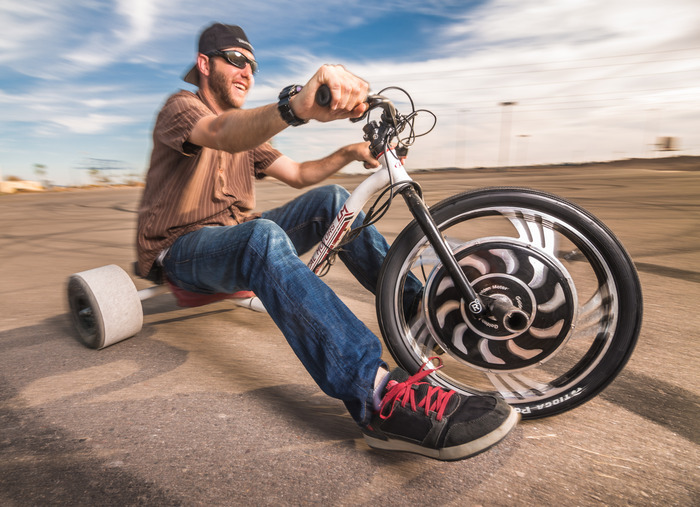 If Drifting Is Your Thing, The Verrado Trike Will Blow You Away | OhGizmo! When it comes to wheeled vehicles it’s easy to become obsessed with acceleration and power figures. But at the end of the day the important thing is how much fun you’re having while driving. To that end, the Verrado Electric Drift Trike by Local Motors might have a thing or two on its four-wheeled cousins, the cars. You might have heard of downhill drift tricking already, but this drift trike trades gravity assistance for an electric engine. Gone are the days where you have to ask your buddy with a pickup truck to haul you back up the hill. This vehicle “combines a BMX fork with a 20” heavy duty front wheel featuring an aluminum casting around the brushless hub motors, two rear karting wheels lined with PVC pipe, a strong disc brake and a powerful programmable electric motor.” A 3 hour charge will give you 45 minutes of fun or up to 12 miles of travel if all you end up doing is going in a straight line. But let’s face it, if you’re going to pledge $1,560 for one of these, you’re really looking to be going sideways around a track, and that’s more than ok. I thought drifting was spinning the back wheels, not watching them follow the front.